Today I’m going to help you redefine ABUNDANCE for yourself. 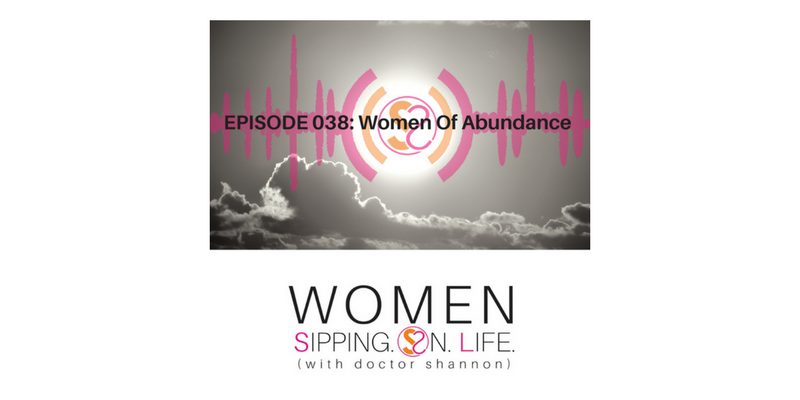 I’ll show you how your value and worth are affecting your abundance, and how to increase your abundance by getting them back into alignment. It starts with certainty, clarity, and getting sure about what you desire. Abundance is exponential, and more than enough to go around. If we as women begin to connect, collaborate, and creatively express who we are together, we are SO much more powerful than we are by ourselves. You must do it for yourself, but you don’t have to do it all by yourself. This is the soul behind WOMEN SIPPING. ON. LIFE. You are NOT alone, my dear! We’re doing this together, and we’re so much more powerful and abundant because of it. Abundance is more than enough. How do YOU personally define abundance? Abundance is a bun dance, which means it’s time to get up and get yourself moving. It’s time to get up and enter into the rhythm of your life. Are you doing a bun dance with each and every moment that you live? Are you in sync with the rhythm of your life? Are you dancing to the music and song of your soul? This is what ABUNDANCE means to me. But YOUR definition is what defines YOU and YOUR LIFE. Is it only physical or tangible things? Or is it exponentially ALL OF YOU combined – body, mind, spirit, emotions, your life, and your life’s work? Again, for me it’s entering into the song of my heart and soul, and allowing myself to sing with all of my oxygen, inspiration, and expiration…until death do I part. People think of a lot of STUFF when it comes to abundance. MORE isn’t necessarily the best. MORE isn’t necessarily MORE. We can have a lot of STUFF. More. More. More. More, and only have a bunch of stuff that quite honestly, buries us! We’ve all done it. We’ve stock piled, but does EXCESS doesn’t equate to excellence. A bun dance…abundance…your life in abundance is excellent. There is something so significant and valuable about abundance. It’s not simply getting MORE. Often, less is MORE. Like I spoke about yesterday in EPISODE 037: Woman Of Certainty, certainty requires getting clear. In order to do so, you must EDIT, and get rid of the excess that’s getting in the way of you seeing your desires clearly. Then you can create the desires that you have in your heart. Abundance starts in the heart. The song of the soul. The rhythm of your life. Are you willing to enter into it today and begin to get clear? Simply profound? It’s not always in the MORE or always in the EXCESS. It’s in ALL…WAYS working for you and your life. Abundance experiences the completion and fulfillment of a desirable life. So what do you value in your life? You can have a lot of money and not have a fully abundant life. You can also have a lot of peace and love, and have zero money. When you start to make the connection between your VALUE and WORTH, you’ll begin to see the results in your emotional AND economical abundance. VALUE is how much YOU value something. How much you love something. You could have an item that’s worthless, but to you it’s valuable because you love it! I made the decision several years ago to get rid of anything that I didn’t absolutely value. If you haven’t done an exercise like this in your life, I’d encourage you begin letting go of anything you don’t value. It’ll open up time and space for you to begin to focus on what you truly value. When you do, you can’t help but focus on your life. Your life is what makes you so valuable. If you hate your life, you’re decreasing your value! Don’t wait another day. Begin to edit out all the STUFF that doesn’t matter, and focus on what does matter. The next step is WORTH. Often value and worth are used interchangeably. Did you notice earlier when I said that you can have a worthless item that you value highly. But you can also value things in a way, that will begin to cause YOU to feel WORTHLESS. For example, you value another person’s opinion that causes YOU to feel worthless. Why are you valuing something that decreases your worth? You hide because you value what others are going to think about you MORE than exchanging the VALUE and WORTH that is YOU. Worth has to do with the cost to produce or develop something. And it’s typically not experienced until you sell (exchange) it. How does this translate to your life? Is there a transaction? Are you exchanging (sharing) your worth, who you are, your inner WELLTH for something of value? If you aren’t, then your worth sits there idle. Instead, you may be valuing things that really don’t have worth, and you’re decreasing YOUR WORTH because you sit..not showing up, not speaking up, not sharing, or expressing the value and worth that are within you (that ARE you.) Then you feel worthless. And the more you do it, the more worthless you feel. So what if you could get (oops…sneeze break) your value and worth coming together in alignment? That way, what you express and exchange with the world…YOUR VALUE…allows your WORTH to increase. Imagine if your value and worth came together? That, my dear, is abundance. At its highest level. Most people aren’t allowing their value and worth to come together. Your desires are what you value, but your worth comes from your belief. If you’re not allowing your beliefs to line up with your desires, your worth and value won’t line up either. Because your beliefs ultimately lead to your behavior. If you’re not exchanging (sharing) yourself by getting active in your life, and expressive in WHO YOU ARE, you will decrease your worth and it’ll affect your abundance. 3. Circle the area that comes up with the lowest level of abundance, and go from there. Begin to look at how much you value it. Are you expressing that value? This will affect your worth. Are you exchanging the YOU that is the most VALUABLE of all. Without YOU there’s no “LIFE” for you. Do you understand? Stop playing small. Stop devaluing yourself. Stop putting your self-worth at a low level of value. If you desire to increase your ABUNDANCE, get clear. Clear about what we’ve talked about today. Begin to get your VALUE and WORTH in alignment, by living what you say you desire and allowing your beliefs and desires to line up. I’d love to hear from you. Try this exercise at home. What insight and take-away did you get today from this very important subject of ABUNDANCE? I’ll look forward to seeing you again tomorrow. Please come over to WomenSippingOnLife.com and leave a comment to let me know how you’re doing. Also, if you haven’t yet subscribed to the podcast in iTunes or Stitcher, please do. Please tell your friends to join in the adventure of Sipping On Life. We, as women of abundance, are so much more powerful, valuable, and worth so much more when we come together than we are trying to do life alone. Don’t do it alone. You are not alone. Stop drowning in your life, and start sipping on it. Come along. Join in the journey. Answer the call in your life. Your adventure is calling, are you listening, my dear?